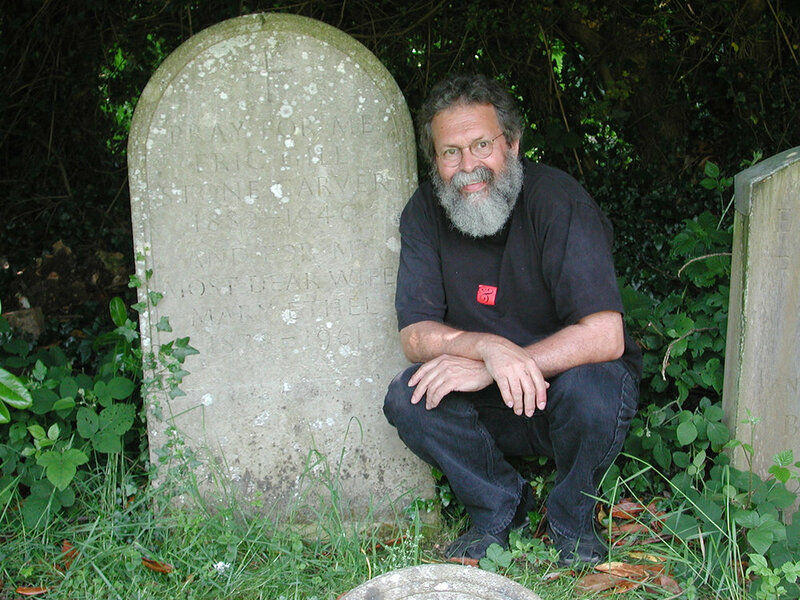 Ray at Eric Gill’s gravesite in Speen, England. A bunch of wonderful items by Eric Gill is going on the auction block today, Tuesday, April 19, 2011, in England. Eric Gill designed some of the really wonderful sculpture along with a few exceptional typefaces (Gill Sans, Perpetua, and Joanna). So, that makes a pretty nice reason to talk about our visit to Eric Gill’s gravesite back in 2001. One of the auction items is Gill’s handwritten description of his burial plans. This from the auction description. 662. Gill (Eric, artist, craftsman, and social critic, 1882-1940) Memorandum re Funeral, etc., autograph manuscript initialed “E.G.” & with a pencil addition by his wife, Mary Ethel, 1p., docket on verso, folds, framed and glazed, 290 x 235mm., 25th October 1940. *** Gill’s funeral instructions. “I desire that my body shall be brought from the place where I die & placed in a plain box of pine wood, not coffin shaped, in Pigott’s Chapel to await its burial. I desire that a Requiem Mass be said in Pigott’s Chapel on the day of my funeral and that my body be taken immediately thereafter to the place of burial. I desire that a simple headstone, like Charlie Baker’s with footstone to match be placed on my grave & that the natural grass mound be retained without kerbs. I desire that there shall be the following inscription on the headstone: PRAY FOR ME ERIC GILL STONE CARVER 1882-194… .” - Gill. “Through summer 1940 Gill was seriously ill, first with German measles, then with congestion of the lung. He had been (and remained) an inveterate smoker, demonstrating working-class solidarity by rolling his own cigarettes. Lung cancer was diagnosed in October 1940. He refused the proposal of a pneumectomy and died in Harefield Hospital, Uxbridge, in the middle of a heavy air raid in the early morning of 17 November 1940. The funeral was held four days later at Pigotts, in the Gill’s family chapel. Requiem mass was said according to the Roman rites. Gill’s body was then transported in a farm cart for burial in the churchyard of the Baptist church at Speen, a curious reconnection with his dissenting ancestors. He had left characteristically exact instructions for his gravestone, allowing space for Mary. The inscription was cut by Laurie Cribb.” - Fiona MacCarthy. Oxford DNB. Our trip to Gill’s gravesite. It was June 2001 and I had gone to London a week ahead of a study abroad group from the Visual Communications Group from the University of Delaware to both attend a D&AD conference and to make sure everything was ready for our nearly two dozen students. One of my first days there I was walking the streets around Russell Square (which would be our neighborhood for the five years I was involved with the study abroad trips) and happened to walk by a used bookstore named Collinge & Clark. In the window was a display of books about Eric Gill. There was also a short typed manuscript of an unpublished manuscript by Gill for £200 which I didn’t buy, but that is a story for another day of self-flogging. Here is the front of Collinge & Clark. I bought five books. I would pull up a chair by the window of my hotel window at night and read. One of the books, a biography of Gill by Fiona MacCarthy, showed a photo of Gill’s gravestone. The students came on June 25, 2001, Jill and I decided to test out the British train system. We looked up Speen (Gill's burial site) and made our best guess as to how to get there. Catch the train to High Wycombe and then take a taxi to the gravesite. It appeared that Speen was about 6 miles from High Wycombe so at the very least we could walk. We stocked up on supplies. A variety of papers bought at Paperchase to do a gravestone rubbing, some rubbing crayons bought at St. Martin’s in the Fields (rubbing crayons aren’t the same as Crayolas), and a killer picnic lunch with lots of cheese and sandwiches. We figured out the train system and caught an early Saturday morning train (we thought Sunday might be a bit more crowded at a church) and set out rather naïvely to meet with Mr. Gill. We were starting to see some potential problems in our plan while on the train ride. The 6 mile walk? Getting back? Roads? We arrived at High Wycombe and walked out to talk to a taxi driver. We told him our story and what we wanted to do. We promised a small tip for the ride out with a much larger tip if he would agree to come back and pick us up at a predetermined time. He agreed, and we were off. The road was incredibly narrow with lots of curves and overhanging brush right to the edge of the road. There was NO WAY we were going to have been able to walk that road and avoid being killed. As we were driving to Speen, we noticed a sign for Pigott’s where Gill had worked. He had printed his book “Essay on Typography” there (and we own a signed copy), but that again is another story. We were on the right track. When we arrived at what appeared on the map to be Speen, there was no town. There were no businesses. JUST a corner. We asked someone along the road if there was a church with a cemetery there. He pointed us back down the road we had just come up, so the taxi turned around and headed back. We passed what might be a church, and for a brief two seconds, you could see a few gravestones. We turned back around and headed up a tiny road beside the church. We got out and immediately I could see Gill’s gravestone at the top of the hill. We agreed that the taxi driver was to come back at 2:30 to pick us up and that the tip would be four times his normal tip (they don’t tip well in England generally). The photo at the top is me with Gill’s gravestone. Above I’m doing a rubbing of the type on the gravestone. Below is one of the finished rubbings. The taxi driver was about an hour late returning, and we were starting to seriously worry and were about asking some other visitors (historians who were recording all of the information on all of the gravestones) to the cemetery if we could catch a ride with them. It would have been awful to have him come back for us and us not be there. So, in the end, the trip had none of the problems we were imagining. We tipped the driver £20. Still, one of the most fabulous days Jill and I have ever spent together. Here is one of the other items for sale in the auction. How often do things like this ever even come up for sale? It was an original woodblock “Raising of Lazarus” with the word ‘And,’ incised with Gill’s monogram and used on p.244 of the Golden Cockerel Press Four Gospels. It went for 10 times more than I could have ever paid.